The cigarette industry started to focus more women than men in the year 1920's. From then on, the campaigns and marketing became stronger and is now continuing to expand globally. Cancers - Smoking can lead to the onset of cancers of mouth, larynx, pharynx, cervix, pancreas, stomach etc. due to the harmful chemicals present in the cigarettes', which can create a breeding ground for the abnormal cells to multiply. Heart disease and stroke - Even though most women die of heart attack and stroke post menopause, smoking can accelerate early risk in younger women. Impact on lungs - Smoking damages the airways and small air sacs in the lungs. This can cause chronic coughing, wheezing, trouble breathing, and long-term lung disease. 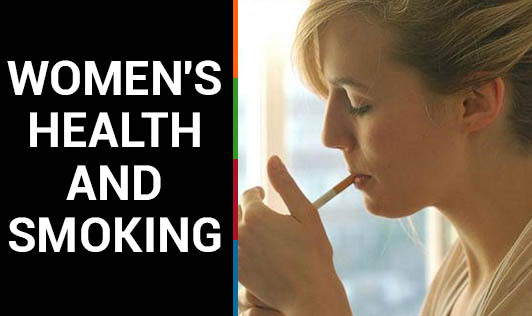 Effects on reproductive health - Women who smoke are more likely to have trouble getting pregnant. Bleeding, early delivery (premature birth), and emergency Caesarean section (C-section) may result from this habit. Smokers are more likely to have miscarriages and stillbirths too. Premature ageing - One of the side effects of smoking is its degenerating effect on the skin. Smoking has an ageing effect on the skin. Osteoporosis risk - Menopausal women who smoke often develop osteoporosis and experience loss of bone density 5 to 10 % earlier than their non-smoking counterparts. It is a proven fact that smoking is injurious to health for men and women; the only difference is that women get affected sooner than men.